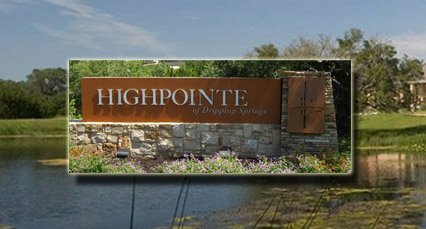 Highpointe is a gated community that features world-class amenities taking full advantage of the natural beauty of the Texas hill country. Located within 20 minutes of Oakhill & 30 minutes of downtown Austin, Highpointe is conveniently tucked away just off Highway 290 West on Sawyer Ranch Road near Dripping Springs. Highpointe has an Austin address but resides in the renowned Dripping Springs School District. Dripping Springs comprises of three zip codes, 78620, 78619 and 78737. Highpointe homes reside in 78737. The unique Resident Club at Highpointe blends into the natural landscaping and impeccable xeriscaping; it features two levels of high-end workout equipment, free weights, machines, stationary bikes, and treadmills. There is an adjacent aerobics studio for group exercise, a kitchen and meeting rooms with wireless internet. The resident Club also features three outdoor pools, including a six-lane Junior Olympic pool and a children’s water park featuring a play-and-splash area. Complementing the Resident Club are miles of hiking and biking trails, soccer and baseball fields, basketball court, tennis courts and a variety of playgrounds and play-scape’s for all ages. Highpointe has many homes for sale and has plenty of expansion room for new home sites. Not all new homes are listed on this site. To find out more about all homes including homes under construction please contact us. We are Realtors that have lived in the Dripping Springs area for 14+ years.